Big volume it can hold many pills. The waist type design, hand comfortable not easy to slide. 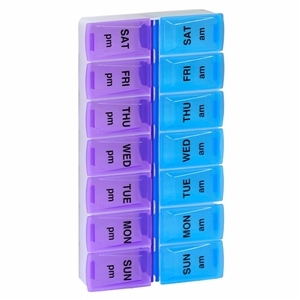 Besides use as a 7 day AM PM pill box,it also can be used single daily. With this lovely pill box you would never forget to take medicine. A week of easy storage of drugs, saving space and easy to carry. Through the break up the lid to remove the tablets, easy to use and flexible. Clear AM/PM marking to help you split you tablets for morning and afternoon. Lids are transparent, and take candy colors, very cute. Everything is clear at a glance.